and activated into service in the power of the Holy Spirit. We are a local expression of the Body of Christ and we incorporate these values into the life of our community. Our purpose for being here is so that the power of the Holy Spirit might freely flow in and through us: equipping us to live victoriously, affecting those we come in contact with, and glorifying God. As God’s beloved children, we devote ourselves to knowing Him better, experiencing continual spiritual renewal, and loving one another even as He loves us. WE ARE W.I.R.E.D. WITH POWER – We are committed to relying on the power of the Holy Spirit. To the degree we are WIRED in connection with Him we move in His power. • WORSHIP – We believe we are meant to bring God the honor and glory He deserves through the way we live our lives. We are committed to lifestyles of worship. INVOLVEMENT – We believe every Christian is called to participate in the life of the church. Like the parts that make up our natural body, we all have important functions. We are committed to regular, ongoing involvement. • RELATIONSHIPS – We believe God, as three persons in One, exists in community. As disciples of Jesus, our relationships reflect His sacrificial love and His model of community. We are committed Small Groups as we grow in our understanding of God and others. • EVANGELISM – We believe God’s plan has always been for all nations, every people group, near and far, to know His love. We are committed to seeking opportunities to share His love and truth with others. • DISCIPLESHIP – We believe change is inevitable but growth is intentional. We are committed to spiritual parenting and mentoring “…until we will be mature and full grown in the Lord,” (Ephesians 4:13, NLT). 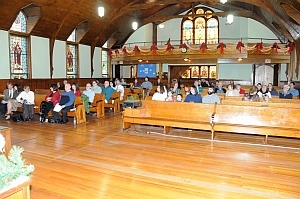 CCC exists to establish and maintain a place of Christian worship, fellowship and training: A place for worship of Almighty God, our Heavenly Father; to provide for Christian fellowship for those of like precious faith, where the Holy Spirit may be honored according to our distinctive testimony; and to assume our share of the responsibility and privilege of sharing the Gospel of Jesus Christ, using all available means, both at home and in foreign lands. A community of people grounded in the love of God, being transformed as followers of Jesus Christ, and activated into service in the power of the Holy Spirit. WHAT IS IT LIKE ON SUNDAYS? On Sundays, we start our mornings with Sunday school classes, which, except for the younger groups, tends to be informal and take on more of a “round-table” discussion. Depending on what series each group is studying, the start times may vary. Make sure that you check out the class times under the get connected link. Service starts at 11:00 a.m. upstairs in the sanctuary. Our time together is started by opening in prayer and we go directly into worship. We would love to have you come and worship with us. We have something for the whole family! Worship during this time is when we honor the Lord our God. It is not only the act of singing and making music, but honoring Him in our hearts. During this time you may observe that each person expresses themselves differently. Some may stand, some may sit. Some may raise their hands while others may be clapping. We view worshiping the Lord as an outward expression of what is happening in our heart, and accordingly, we welcome each person to come and worship the Lord our God. After worship, we take moment to say “hello” to each other before we start the message. During this time, little ones under the age of 5 will head down to the Nursery, while Pre-k through Fifth Graders head down for Children’s Church. Afterward, we go over announcements and take up an offering. This may be awkward for some, but please do not feel obligated, as we do not “charge” people to hear the message. Every week, Pastor Tony teaches a biblically relevant message (meaning: you will find that this message is specifically speaking to you about your life!). We do not have a dress code, and as such, some may be wearing blue jeans and a tee-shirt, while others are dressed more formal, wearing a dress, or shirt and tie. Please dress however you are comfortable. After the service, we open the front of the sanctuary for prayer. Should you find that you would like prayer, we have a wonderful group of people who would be honored to pray with you. You will find that everyone tends to stay around after the service and talk with one another. There is something for everyone. Some head down to the Fellowship Hall for coffee and conversation, others head into the recreation room for a game of foos ball or ping pong, and others get together for prayer. Whatever you decide, you’re invited and welcome to stay as long as you like! (Last one out locks up!) Coffee, tea and breakfast pastries are served in the Fellowship Hall throughout the day!